How does the event work? As you adventure through Neverwinter, players will be able to collect Wondrous Grommets that will drop from slaying enemies. This tiny mechanical component is so fascinating it will spur players to explore what extraordinary devices one could create by combining more of these items. Much like the current refinement system, players will combine Wondrous Grommets to create higher tiered items. As players progress through the item ranks, the more refinement points will be needed. 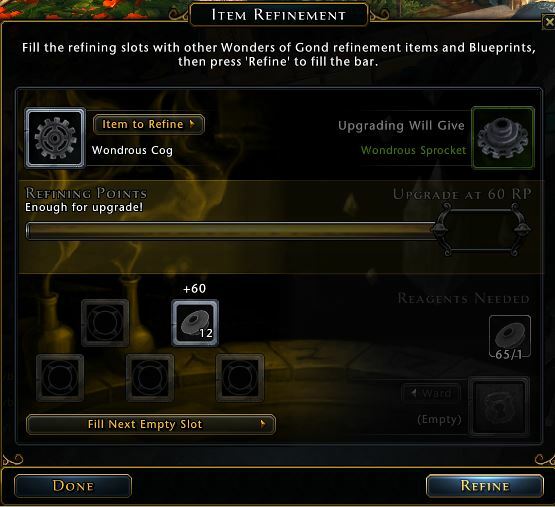 Refinement points can only be gained by using Wondrous items such as the Rank 4 Wondrous Gadget, the Rank 2 Wondrous Cog and the Rank 3 Wondrous Sprocket. 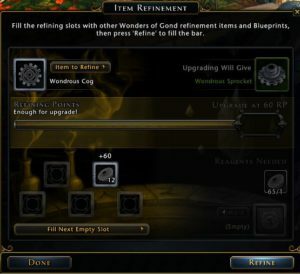 In addition to finding the wondrous items via the creatures of the Forgotten Realms, a limited-time task will be made available for most crafting professions to get Neverwinter Diamonds. This Level 6 task allows players to convert unrefined crafting materials into a Rank 3 Sprocket, and at higher tiers of success, a Rank 4 Gadget along with several Rank 2 Cogs and Rank 1 Grommets. What rewards can players earn? Adventurers will continue to upgrade the wondrous items until they can create the pinnacle device, the Doohickey. This device represents the pinnacle of mechanical ingenuity and would impress Gond himself with the fine craftsmanship. Not only can you use this item to deal damage to your foes, this item can be turned in for a chance to receive the Apparatus of Gond Mount or the Embellished Apparatus of Gond!